Full digital interpretation system-Full digital multi-language interpretation console Interpretation console RX-E9264-Restmoment Digital Audio Device Co., Ltd.
Ø 256X 64 LCD display. It can display conference information and working status real time. Ø This system adopts 6PIN hand by hand connection. Ø Full digital audio transmission technique; Point to point connection; Remote transmission won’t influence on sound quality. Distance between equipments could reach at 150m. Ø Adopt full digital audio codec technology and digital audio compression technology. The sound is near CD quality after infrared transmission. Listeners have comfortable, natural and high quality sound finishing. Ø Sampling frequency reaches 48K; Frequency response of all 64 channel can reach 30Hz – 20KHz. Ø 8/16/32/64 (including floor channel) multi-language interpretation function and monitoring function. Working with channel selector or infrared system to extend the audience. Ø Hand by hand in line connection between consoles. 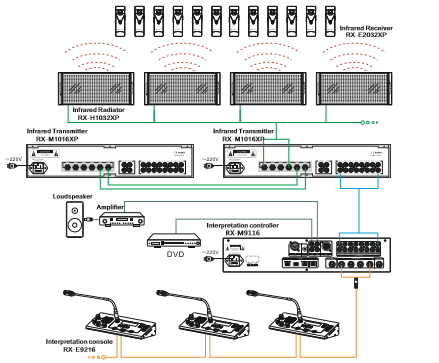 One interpretation controller can connect 80pcs consoles max. If one console has problem, other consoles can work well in the line. Ø Built-in high-pass filter which can filter out the unnecessary low frequency component. Ø Same channel interlock function. And it has channel occupancy light to make sure the channel’s uniqueness. Ø Second translation function. If the interpretor can not understand floor language, he can listen to other interpretor’s sound to do second translation. Ø Cough elimination function. Interpretor can turn off microphone shortly to prevent cough sound to conference hall. Ø Speaking speed remind function. Interpretor can press key to remind speaker. Ø Help function. Interpretor can press HELP to call operator.Preset language name either by the main unit or the application software. Ø Channel selector knob to choose input language channel easily. Ø Preset 3 interpretation audio source output channel and shortcut keys(A/B/C) with channel occupation light. Ø Microphone gain and EQ adjustable individually. Ø Software can switch A/B/C output channel and turn off the console. Ø Built-in IC Card reader. Ø Built-in loudspeaker with volume control. If all microphones in the same booth are off and “FLOOR” indicator is on, the loudspeaker will play floor language. Ø Allows an interpreter to override another interpreter in same booth supplying the same interpretation channel. Ø Maximum 6 interpretation units can be installed in each booth. Ø System has memory and playing back function. Ø ON/OFF key for key tone. Ø Built-in multi-channel intercom facility. Ø System has arbitrary distribution ID address. Easy to install. Ø Connected to interpretation controller individually. Or connected to system controller with other speaking units. Ø Earphone output jack for headset earphone; Microphone input jack for external microphone. Ø Microphone pole with speaking indicator light. Ø Removable microphone pole, easy to be transported. Ø Table top or embedded installation.